Every human being has a blind spot that he or she cannot see around. We can do our best to try to adjust our sitting position in the vehicle to minimize the blind spot as much as possible, but it is virtually impossible to eliminate it entirely. 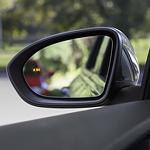 Therefore, it is very nice that automakers now generally include blind spot monitors as part of the overall package that they offer on many new vehicles. It is something that may just help us all turn into better drivers who avoid these types of accidents by and large.